The creation of Design for London followed the re-establishment of metropolitan government in London in 2000. Since then innovative approaches have been developed for delivering design-led urban regeneration, infrastructure and public space projects in terms of collaborating with local authorities, involving young architecture firms or public participation. These strategies might be inspiring for other cities, for example Berlin. Berlin is also known to be a laboratory to test new ideas in urban planning, such as kick-starting urban development through temporary uses or using international building exhibitions as a means to raise design standards. Both cities suffer from great financial constraints which might lead to urban planning and design resources being scaled down. New approaches of how to achieve urban design quality are needed. The public lunchtime lecture will give an introduction to current urban design strategies and their implementation in the two cities. The insights gained will feed into an exchange of thoughts between Design for London and the Senate Department for Urban Development Berlin. 29. Oktober 2010 ab 13 Uhr an der TU Berlin statt. Die Vorträge werden in englischer Sprache gehalten! London: Have we seen an Urban Renaissance? 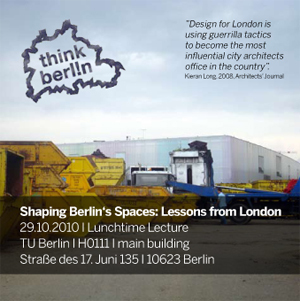 Der Workshop wird organisiert von: Tobias Goevert, Eva Herr, Aljoscha Hofmann und Cordelia Polinna in Kooperation mit: Think Berl!n, Design for London und dem Center for Metropolitan Studies.